Holy stromboli, are the hills alive here in the Sierra Nevada or WHAT? We’re most def experiencing variable Spring time weather with the warm sunny days punctuated by cooler rainy ones. 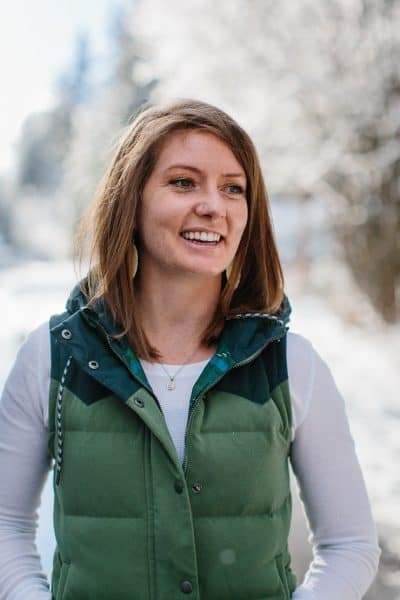 Our mountains are already turning pretty green, our birds are starting to sing a tune or two in the morning, people are acting a-fool, brunch season is game ON, bathing suits are being dusted off and looked at from odd angles, it’s time to trade cheese for vegetables (don’t shoot the messenger). The other day I was craving vegetables (shocker)…in the form of fried rice (make sense, right?). 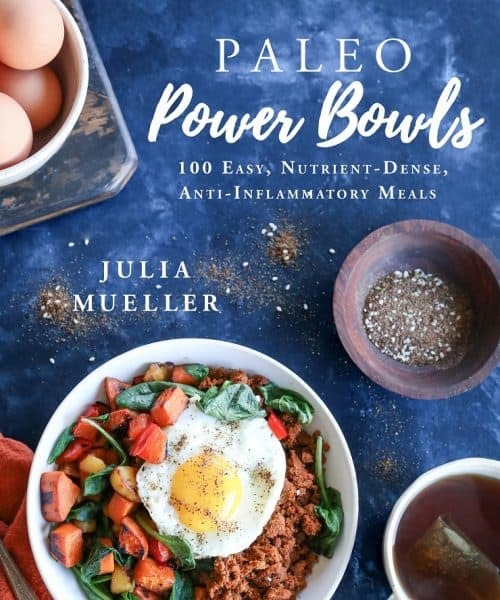 Every week, I make a big batch of rice (because: gluten-free carb of choice) to eat alongside whatever kit and caboodles (main entrees) I prepare, and recently it dawned on me : why stop at steamed when I can add a plethora of sauteed veggies and call it an entree? BOOM make-ahead meal of champs. The vegetable-to-rice ratio in this application is so on point, I can barely stand it. Basically we’re looking at a heaping mound of sauteed vegetables with a rice chaser…just the way a good vegetable fried rice should be. …my new Wolf Gourmet stainless steel cookware. HAVE.YOU.SEEN.IT? The kind folks at Wolf Gourmet sent me their 10-Piece Cookware Set, and you’uns…it is fab. For this particular recipe, I used the 2-quart saucier to steam the rice, the 3-quart saucepan to saute the veggies + fry the rice, and the 8.5-inch skillet to scramble the eggs to add into said fried rice. The line is so flipping gorgeous, I can barely stand it…the cookware is thick, durable, easy to clean, contains super pimp handles, and it’s just so pleasing on the eye sockets. You can purchase the set from Bloomingdales. Moving right along from my show-and-tell, let’s talk recipe prep. All’s you do it saute the vegetables, add in the cooked rice, stir in the scrambled eggs, then whamo: Basically a side-dish-made-entree. Basically what I eat when there are no men in the midst to feed. Basically the best companion to binge watching Workaholics on Hulu, slash any Gerard Butler movie.evah. While rice is cooking, saute the vegetables. Add the olive oil to a large skillet, wok, or saucepan and heat to medium-high. Add the broccoli and bell pepper and cook 3 minutes, stirring occasionally. Add 3 to 4 tablespoons of water, cover, and continue cooking until broccoli is bright green and veggies have begun softening, about 3 to 5 minutes. Add the shredded carrot, ginger, garlic, cumin, and cayenne. Continue cooking until garlic and ginger are very fragrant, about 3 minutes. 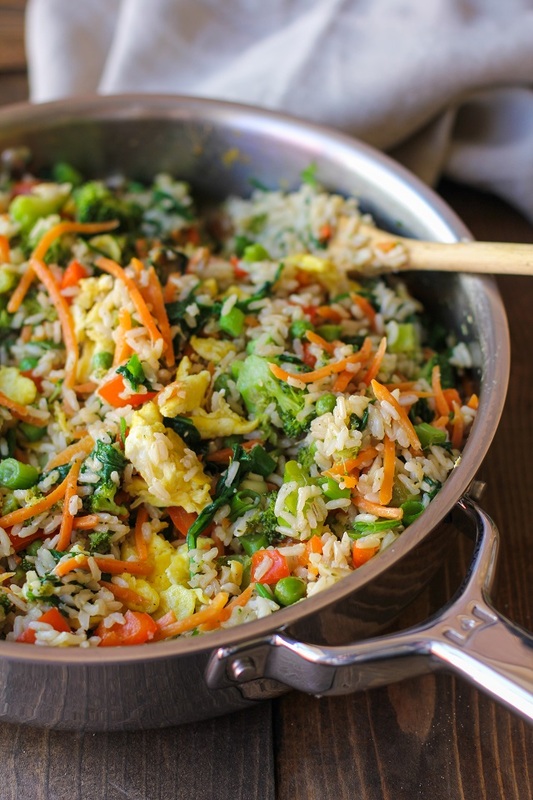 Transfer the cooked rice to the skillet with the veggies, along with the green onion, peas, and liquid aminos. Stir everything together well and reduce the heat to medium-low. Allow the rice mixture to sit as you scramble the eggs in a separate skillet. Once cooked through, add the scrambled eggs to the fried rice, along with the spinach. Cover and cook until spinach has wilted, about 3 minutes. Stir everything well and taste for flavor. Add sea salt to taste, along with more liquid aminos, hot sauce, tahini, wasabi, etc. Serve alongside your favorite entree. HAPPY SPRING TO YOU!!!! Man, it sounds like it’s beautiful out where you are. We’re getting quite a bit of rain here, too, and there’s soo many flowers in bloom around my house. So beautiful! Gorgeous fried rice to kick off spring! Yay for spring!! I’m not dusting off my bathing suit just yet but I’ve been eating the ish out of strawberries lately and they are SO damn good. Bring on the spring produce and the vegetable fried rice! This is my kind of simple weeknight meal and I love the way it looks in that gorgeous stainless steel skillet. It’s so purdy! The perfect meal for my meatless Monday! Yay for spring produce!! And this delicious recipe! Loving all the egg action going on here. Pinned! This just scream ‘spring’! 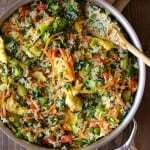 I love veggie rice dishes, they’re hearty but still light and clean. My mouth watered reading that spring produce list! I hope they get delivered to me in my CSA box! I LOVE spring food! It’s fresh and light and so so good. 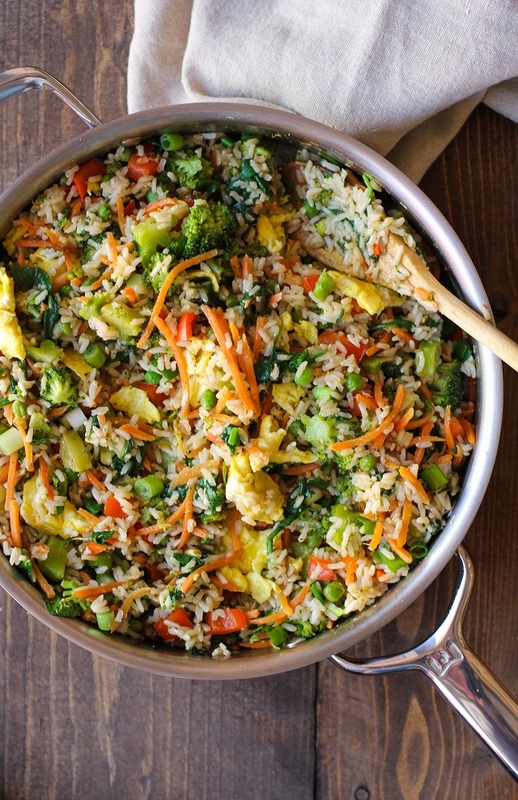 This fried rice looks like serious comfort food- love all the veggies in there 🙂 Pinning! OMGOSH the rice sounds so good. On the MENU FOR TOMORROW AND LEFTOVERS ALL DURING THE WEEK. 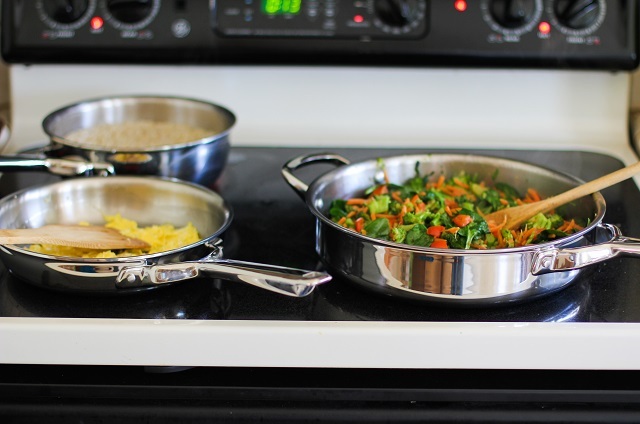 What a pretty set of pans, full of healthy, yummy food. Great recipe. I hadn’t thought of loaded fried rice in a long time. We will have to add that to our menu this week. I made this tonight for dinner and it was amazing loved it I added asparagus to mine as well.